Giving Serious Thought to a Whole-House Generator? We Can Help! The term radiant heating is a general description of a type of way heat spreads. Heat can move in three different ways: convection heating, conduction heating, and radiant heating. Convection is the movement of heat through the movement of air, such as the warmth you feel from a forced­-air furnace sending warm air into a room. Conduction is heat passing through contact, such as placing your hand on a hot surface. Convection is heat passing from one heated object to another through the air but without changing the temperature of the air. Radiant heating is the warmth you feel from pavement on a sunny day or when you put your hand near a glowing lightbulb. The most common way to provide radiant heating to a house is through a hydronic heater, i.e. a boiler system. The boiler system sends heated water to a terminal point like a radiator, raises its temperature, and sends heat waves into the room. The newer technology of using hydronic power to heat the floorboard themselves is the development in radiant heating that has really gotten homeowners excited. Radiant heating is energy efficient in a way forced-air heating isn’t. Water is a better heat transfer medium than air, so it requires less energy to provide the level of heat a room needs than other types of heaters. A radiant heater consumes much less electricity than other systems—and this includes gas-powered furnaces, which still must use a powerful electric fan to distribute heat. Homeowners who want to go off the electric grid will find a radiant system helpful. The spread of heat from heated floorboards provides heat evenly through a space, much more than forced-air heaters and even more than standard radiators and baseboard heaters. This means faster and better comfort. 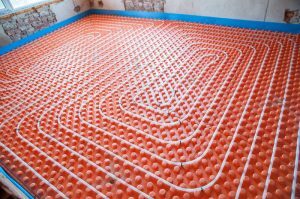 As with other hydronic systems, radiant heating has a long service life with a reduced number of repairs. Radiant heating simply feels better, something that’s harder to define but which you’ll hear from many homeowners who have it installed. On a cold morning, nothing feels better than to wake up to a warm floor under your feet! We offer full service for radiant heating in Oak Park, IL. This type of heating isn’t suited for every home or situation, so please call us first so you can discuss options with us. We offer many different types of heating installations, and we can find the best one for your house. ServiceMax is open 24/7, all day, every day. Call us for all your heating services in Chicagoland.